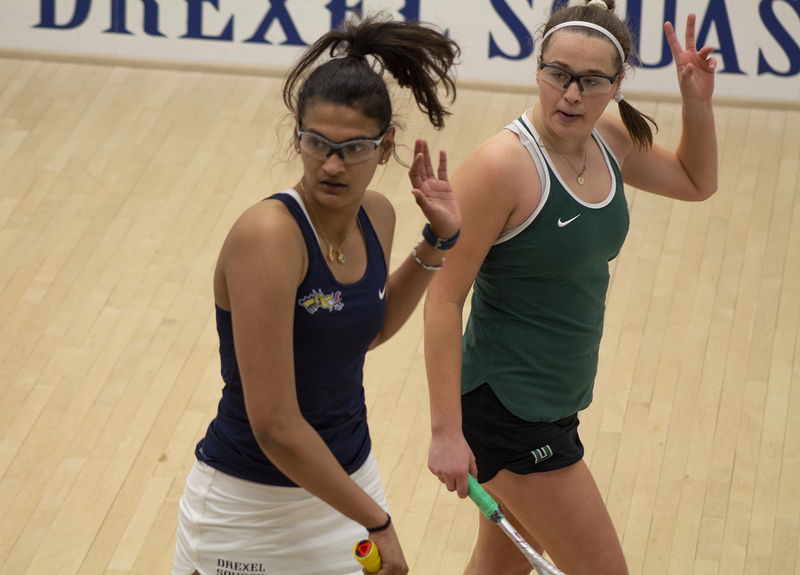 After a dominating win over Dickinson College by Drexel University’s men’s and women’s squash teams, and a devastating loss by the men and close loss by the women against the University of Pennsylvania, the Dragons looked to get back to winning records with home matches at the Kline & Specter Squash Center. Both the men’s and women’s teams also played the University of Virginia Nov. 17, and the women’s team had a match against Stanford University Nov. 18. The men’s team got off to a very strong start against UVA, as freshmen Noel Heaton, Filip Krueger and Matias Knudsen all defeated their opponents. Heaton got a shutout win over Jarett Odrich, 11-4, 11-4, 11-9. Krueger and Knudson both lost a game, but ended up winning their matches, 11-4, 11-13, 12-10, 11-1 and 9-11, 11-5, 11-2, 11-4, respectively. However, during the next match, senior Will Grady went down in straight sets, 11-9, 11-7, 11-7. Up three games to one, the Dragons were off to a strong start. Senior Luke Willemse kept this going with a 3-0 win over Grayson Bubrosky 11-7, 11-5, 11-8. Senior Bransten Ming also got a win over Patrick McElroy 11-9, 11-3, 11-6 to put the Dragons up 5-1. The Dragons won one last game before losing two, but ended up winning 6-3 over UVA. The women’s team had a very similar result against UVA with their 6-3 win. They started off by winning their first three matches with wins by sophomores Hannah Blatt, Mariam Kamal and Ona Prokes. All three played very contested matches but ended up with 3-1 wins. Blatt defeated Emily Woodworth, 11-1, 9-11, 11-6, 11-6, while Kamal defeated Amanda Haywood and Prokes defeated Diane Tyson 11-8, 3-111, 11-8, 11-7 and 12-10, 11-5, 5-11, 11-6, respectively. However, senior Apoorva Addepalli lost in straight sets, 11-7, 11-5, 11-7, getting Drexel to a 3-1 lead. In the second round, freshman Brooke Herring and senior Fiona Power both won in straight sets, powering the Dragons to a 5-1 lead. Herring defeated Caroline Baldwin 13-11, 11-7, 11-3, while Power played a much more contested match, but came away with the win, 12-10, 11-9, 11-7. Afterward, sophomore Stephanie Ryan played a very contested match, where after winning the first two matches by a small margin, she lost the third, but bounced back to give the Dragons a 6-1 lead. UVA won the next two games, but it was not enough to overtake the Dragons. The women had additional matches against Stanford. However, this matchup did not go as well as the previous one. Blatt and Kamal came out with straight set wins, with Blatt winning against Chloe Chemtob, someone she had not beaten previously. But, after that, every match was a loss for the Dragons. Ryan and Prokes had games that were close, but were not enough to beat Stanford, who won 7-2. Both the men’s and women’s teams returned to the Kline & Specter Squash Center to play Dartmouth College Nov. 28. The women defeated Dartmouth 5-4, but the men unfortunately lost 7-2. The squash teams will face Yale University Nov. 30 and Williams College Dec. 1.